Building LED arrays that can display all sorts of different patterns is pretty easy these days. Hook up an Arduino, do some charlieplexing, and off you go. When [Viktor] was younger he didn’t have all those fancy schmancy microcontrollers and circuit simulation software you kids have these days. In fact, last we heard, he had to walk to school uphill both ways – in the snow. That didn’t stop him from building this gem of a project back in 1987. His LED chaser/light show does not use any microcontrollers at all, rather it relies on an EPROM to store predefined display programs. A series of switches are installed on the front of the flasher, allowing him to easily switch between the programs, and a pot is mounted to the front of the device to control the speed of the LEDs. His light show is pretty slick, even for a project built over 20 years ago. Sometimes you just can’t beat a good, old-school hack. Continue reading for a video demonstration of [Viktor’s] programmable light show. Toppling dominoes is great fun for about 30 seconds at a time, when you are not busy setting them up for another run. [Randy] thought it was about time they got an electronic makeover to allow for constant, immediate gratification. 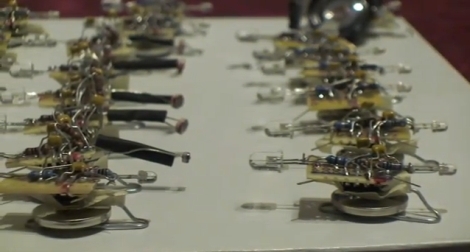 Armed with a few simple electronic components, he has created Le Dominoux. These LED-based electronic dominoes are actually quite simple to build. Each basic Le Dominoux is constructed on a small square of protoboard and consists of either a photo cell or phototransistor, a 555 timer, and an LED, all powered by a coin cell battery. The 555 timer, which is configured as a one-shot, is triggered when the photosensitive component on the back side of the domino is exposed to a bright enough light. The LED on the front end of the domino is then illuminated one time. This process is the electronic equivalent of a single domino toppling over. He has constructed several variants of the Le Dominoux to act as flashing triggers, for outputting sound, as well as for turning tight corners. These variants allow the dominoes to be configured in many different ways, creating self-sustaining light shows. If anyone is looking for a fun project to introduce kids to electronics, this would definitely be it. Stick around to see a video of Le Dominoux in action – we bet you can’t stop watching it. This is of course [Randy’s] entry in the 555 Design Contest, which ends tonight at midnight EST. At one point or another, who hasn’t had a dream in which you could fly, simply by thinking about it? [Yehuda Duenyas, aka XXXY] is currently working on a project at Rensselaer Polytechnic Institute which can allow you to do just that. 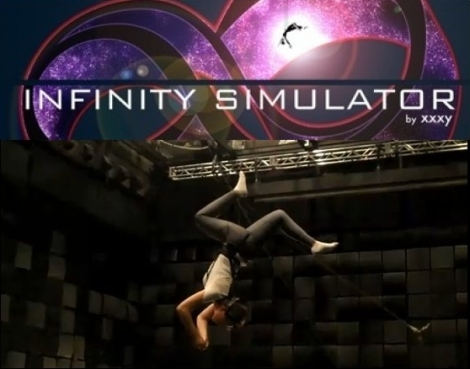 As part of a thesis project dubbed the “Infinity Simulator“, he has constructed a system that allows people to fly about using the elaborate rigging system at RPI’s Experimental Media and Performing Arts Center. His project allows users to glide through the air, walk up walls, and otherwise live out their flying fantasies, with mere thoughts. An EEG headset is placed on the user, along with other wearable sensors which enhance the audio and visual experience of the person in flight. With enough concentration, the rigging system sweeps people off their feet, sending them soaring anywhere their mind desires. It sounds a bit like pretending to be Superman while using The Force to us, however the installation is described on the EMPAC web site as a “live-action stunt show crossed with a video game.” Either way, sign us up! Hopefully we will see some video of the completed project in the near future, but in the meantime keep reading to see a behind-the-scenes preview of the flying rig in action. 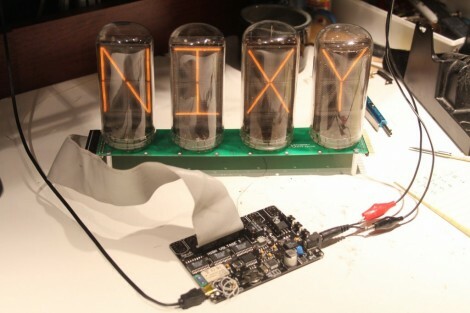 [Bob Coggeshall] has a nice Nixie tube driver board coming down the pipes. It’s not quite ready yet but you can see by the image above, it offers something that isn’t always easy to find; control for B7971 tubes which can display the full spectrum of alpha-numeric characters. This board is not limited to just one type of tube and it can be chained together with other boards to create longer displays. But perhaps the best development is the addition of a Bluetooth module. [Bob] has incorporated a Roving Networks RN-41 Bluetooth module which takes care of all aspects of the wireless protocol. This way the display is not tethered to a computer, or limited to data stored on a chip. We can’t really say that it’s wireless though, as we’d assume a set of these big tubes would rip through batteries pretty quickly. 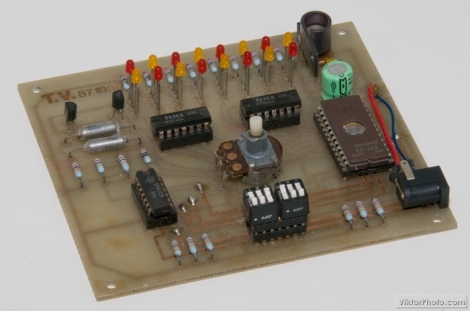 Keep an eye on this project, it will be open source once the bugs are worked out and [Bob] will also sell fully assembled and tested boards for those who choose not to roll their own. We wonder if it would be easy to pair this with your phone and use it to display incoming call information? [Drewbagd] was inspired by the 555 timer contest and decided to make this his very first electronics project. It’s an accessory for a drinking game called the Power Hour. The game (if you could call it that) consists of contestants drinking one shot of beer every minute for one hour. [Drewbagd] points out that timing the shots can be an issue and so he decided to augment each shot glass with its own timer. He added a base that consists of a ring of LEDs surrounding a 555 timer and the cap and resistors. 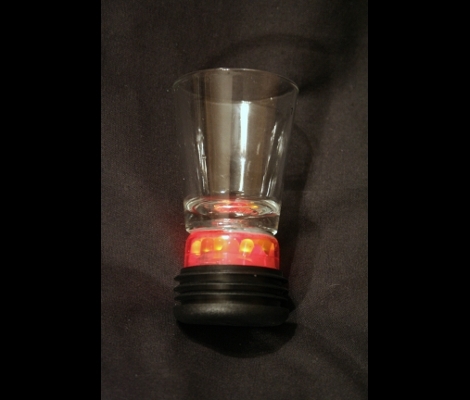 This causes the timer to oscillate from illuminated for a few seconds (drink) to dark for one minute (refill). He calls it the Powered Power Hour. The video after the break shows off the functionality, and it hints at a bright future for [Drewbagd] as an infomercial Emcee. He’s got a supporting post that detail the electronics and outline some of the prototyping issues. We were happy to hear that when he got stuck he found help over on Hackaday’s forums. Thank you to all who participate in the community by sharing their knowledge. 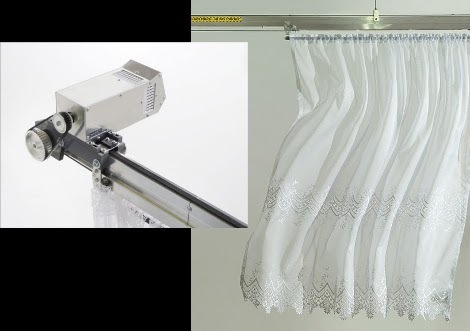 [Niklas Roy] upgraded his privacy curtain and is taking it on the road. Regular readers will remember the first version that resided in his shop window and used video processing in conjunction with a motor to keep the small bit of curtain in front of any passersby. We’ve embedded the original demo video after the break and it’s not to be missed. But now he’s decided to make some upgrades to the system because it’s going to be shown as an art display. He looked around for a motor upgrade but found that the best motor at the most reasonable price could be pulled from a Makita power drill. The track itself is modular, making the installation scalable up to ten meters in total length. He even built a clean-looking laptop dock that handles the video processing end of things. But there’s something here for you as well. He’s released all of his source code, schematics, board design, and even the SketchUp files for the motor mounts and other parts. Dig out that old power drill and build one of your own. Encourage your kids to play with their food by making a cake that looks like a toy. 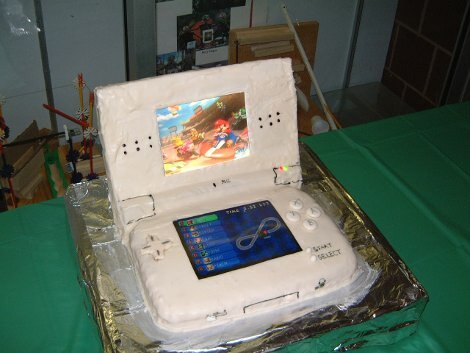 The Nintendo DS lookalike houses some electronics to spruce up the presentation. The upper panel is cardboard covered in frosting to tie it in with the edible lower sections. That cardboard panel hides a couple of LEDs that blink thanks to a blinking Christmas light bulb in series with the diodes. There is also an LCD screen backlight in the form of to CCFL bulbs. The screen is just a still image but that’s okay, you can’t expect an actual video screen to be built into this. Take a look at the clip after the break to see the internals. We’ve looked in on a few other cake hacks in the past. If you missed them before now’s your chance to revisit the gantry-based frosting dispenser and the turn-table frosting injector with silver-orb detailing. These are some sweet hacks!